Western Digital, as one of the few external drive companies who actually make their own equipment, has always been on the cutting edge in this highly competitive marketplace. Their My Passport Ultra line continues this fine tradition and is packed with numerous upgrades over its predecessor. The most noteworthy upgrade is a new ultra small footprint; both the 500GB and 1TB models will only be 110mm by 81.6mm by 12.8mm in size and weigh in at less than 160 grams. Better still, later this year a 2TB 230gram version will also be made available but it will come in a 2.6mm thicker case. WD is able to trim the size by shipping the drive with USB 3.0 bridge soldered onto the board where the SATA normally is. The real game changer for the My Passport Ultra will not be its increased capacity or smaller footprint; rather it will be the upgrade software all will come with. Unlike previous models, the new SmartWare Pro software can be configured to automatically backup all data to your DropBox account, making this the first My Passport with ‘Cloud Storage’ capabilities. Add in a three year warranty and this new line promises to live up to its ‘Ultra’ moniker. 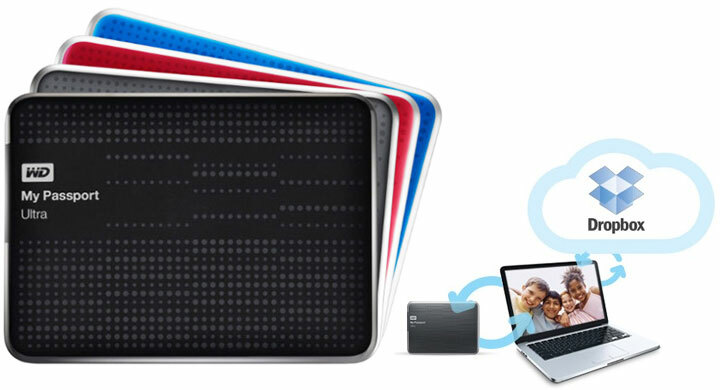 The new WD My Passport Ultra line-up comes in Black, Red, Blue or silver and is available online for $99 to $129 right now, with the 2TB model to land later this year.